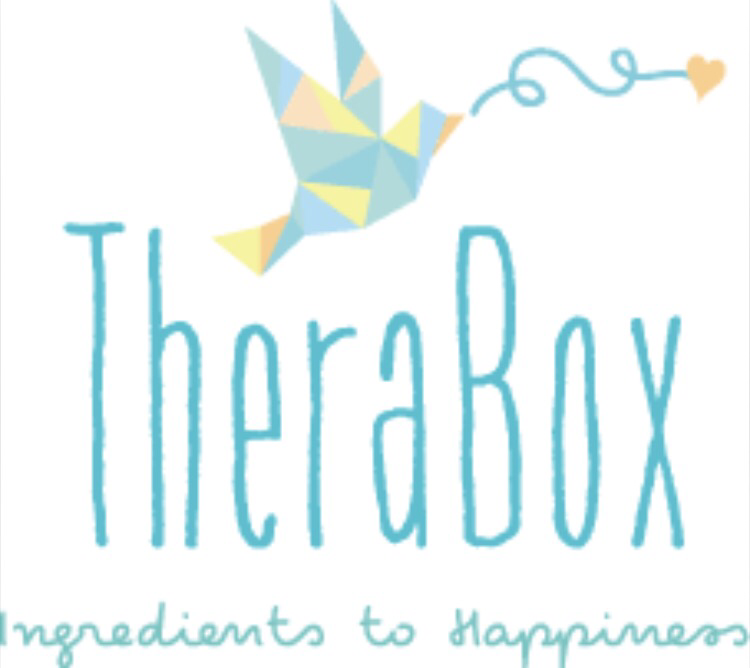 Therabox is mindfully curated by therapists to reduce stress & increase joy! 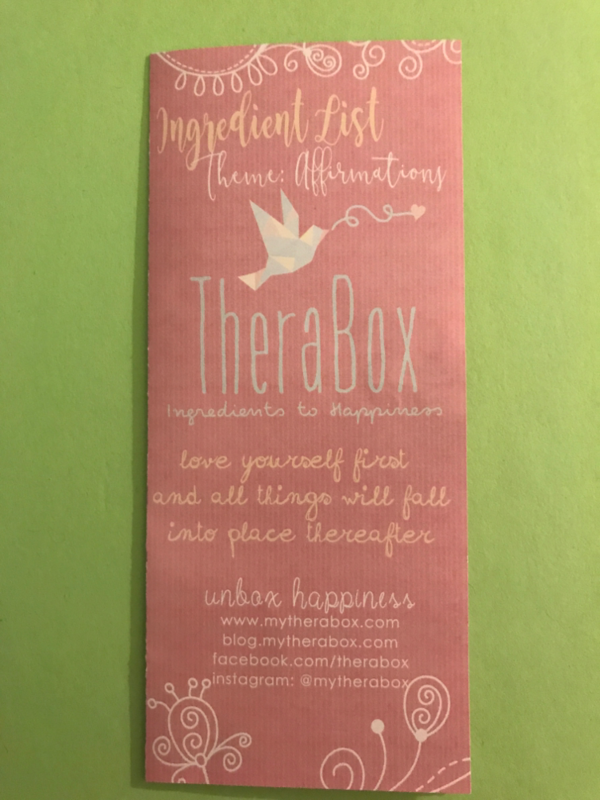 Subscribe to happiness.... each box is curated by real practicing therapists & inspired by evidence based research. Each box comes wrapped in plastic, and as soon as I removed my plastic there was a grittiness everywhere. 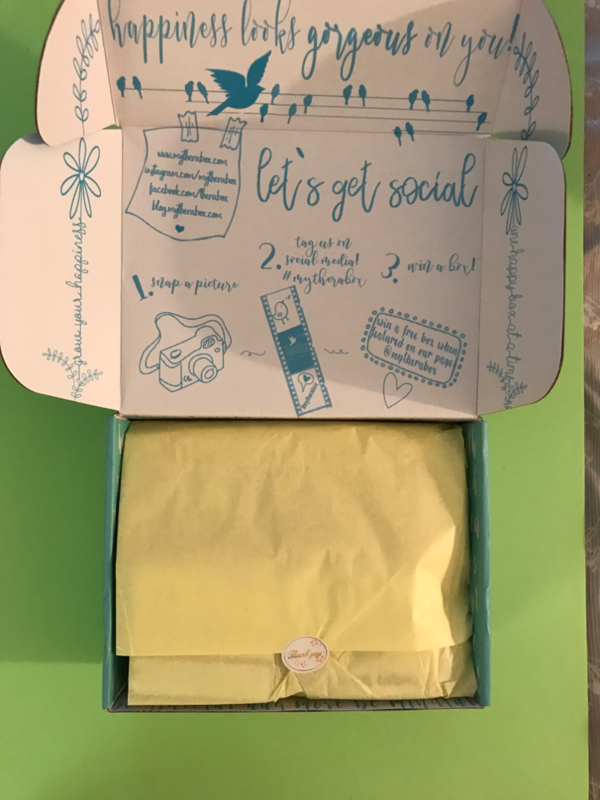 Like a lot of boxes you can win your next box by posting on social media. Each box comes with a pamphlet. It lists each item, gives a description, the retail value of each item, and what it would've cost to have shipped to you, had you purchased the items on your own. 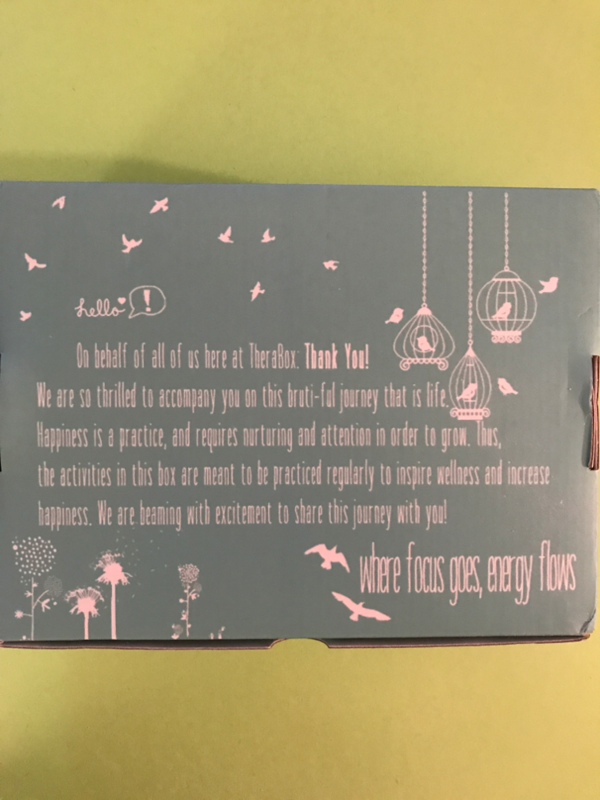 On the back, what I can't show is, there's a private Facebook group for people who receive this box. 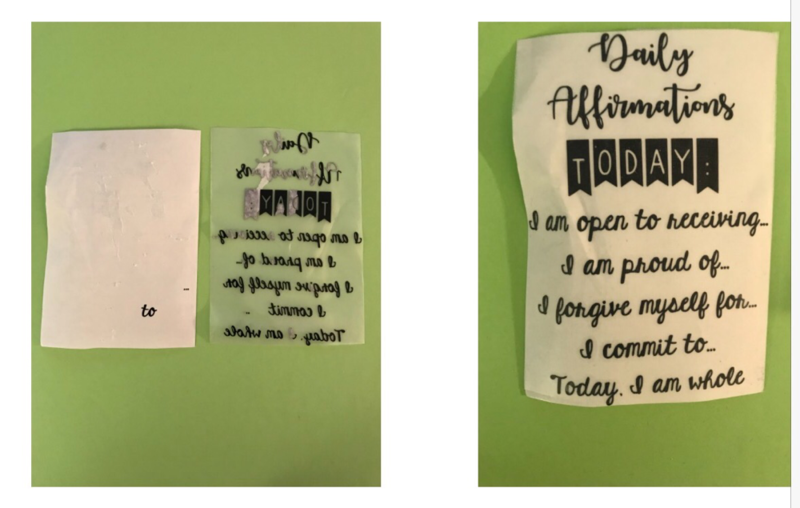 The first item is a sticker of affirmations that you place on a mirror to say to yourself twice a day. As you can see mine was deffective. I contacted them and they sent a replacement. 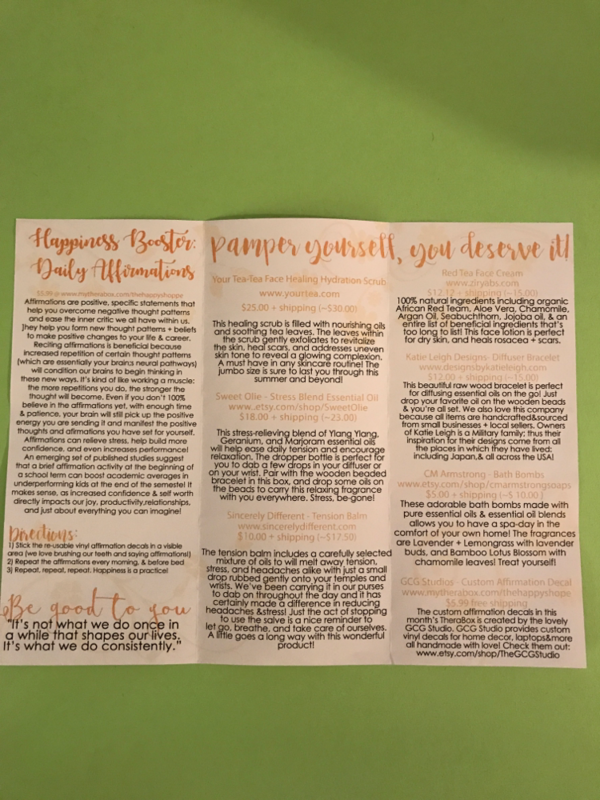 As you can see it's different paper. I put this on my full length mirror. 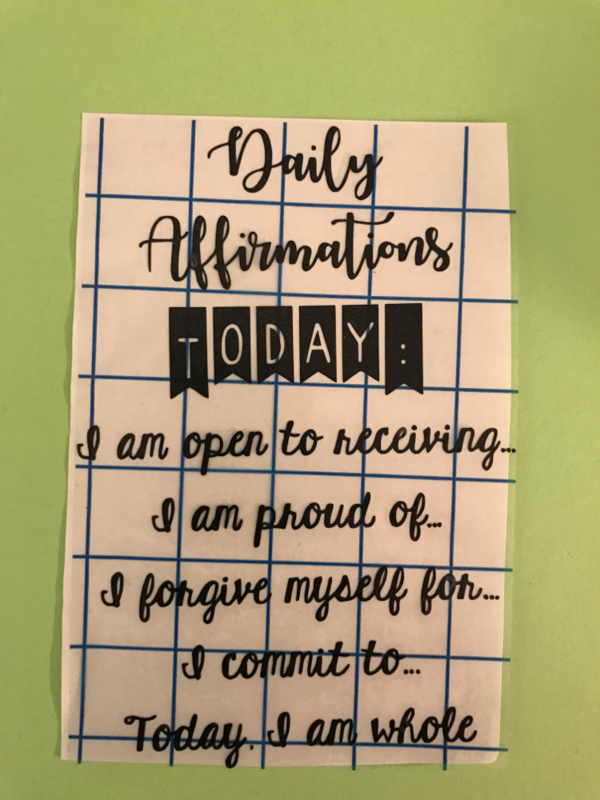 I'm not good with affirmations, but I'm working on it. 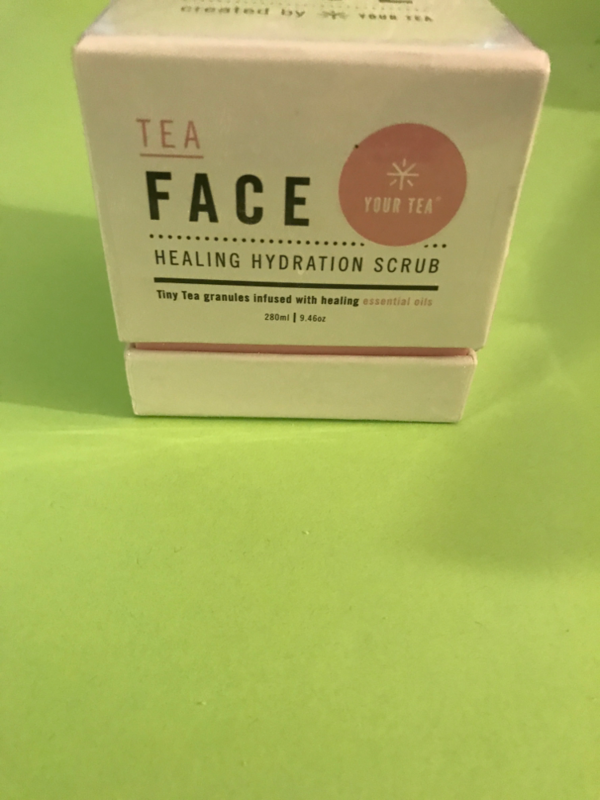 Your Tea-Tea Face Healing Hydration Scrub. This scrub is filled with nourishing oils and soothing tea leaves. 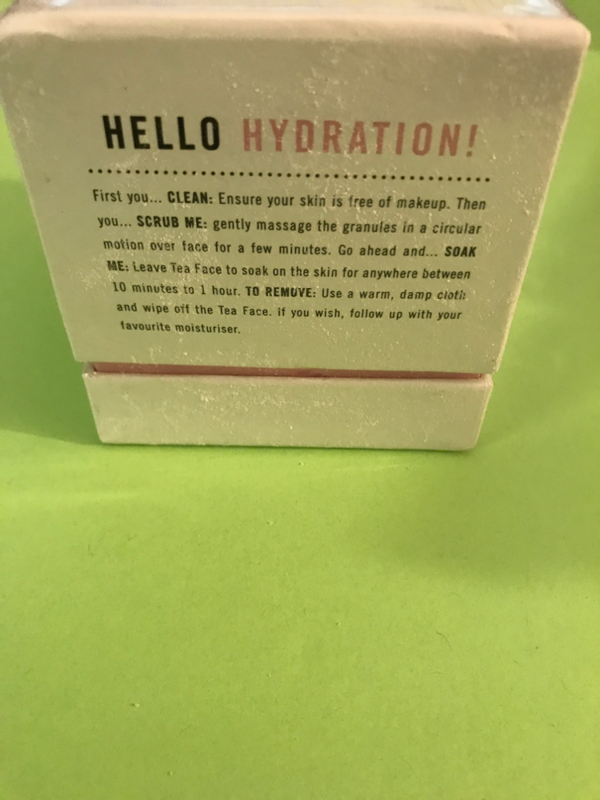 It helps to revitalize the skin, heal scars, and address uneven skin tone. The retail Value is $25.00 + $5.00 for shipping. As you can see the grittiness was all over this. I'll explain why shortly. 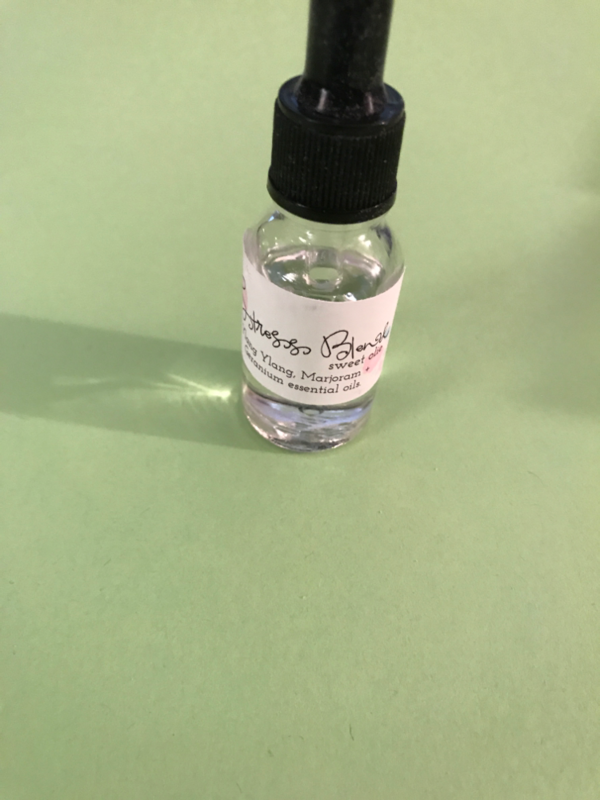 Sweet-Ollie-Stress Blend Essential Oil. 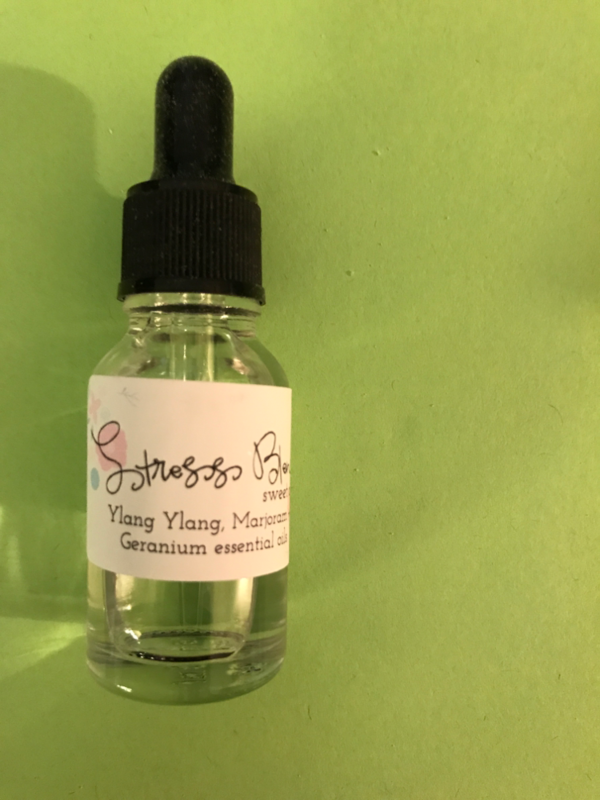 This stress-relieving blend of Ylang Ylang, Geranium, and Majoram essential oils will help ease daily tension and encourage relaxation. I used this in my essential oil diffuser and it smelled wonderful. I just need to use a little more next time. It was my first time using the diffuser. 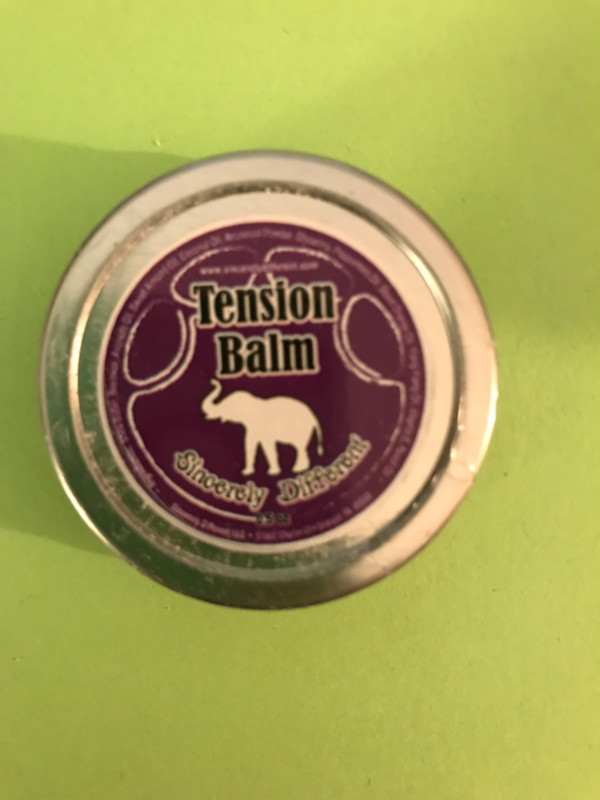 This tension Balm includes a carefully selected mixture of oils to melt away tension. I have a medical condition that one of the symptoms is headaches. 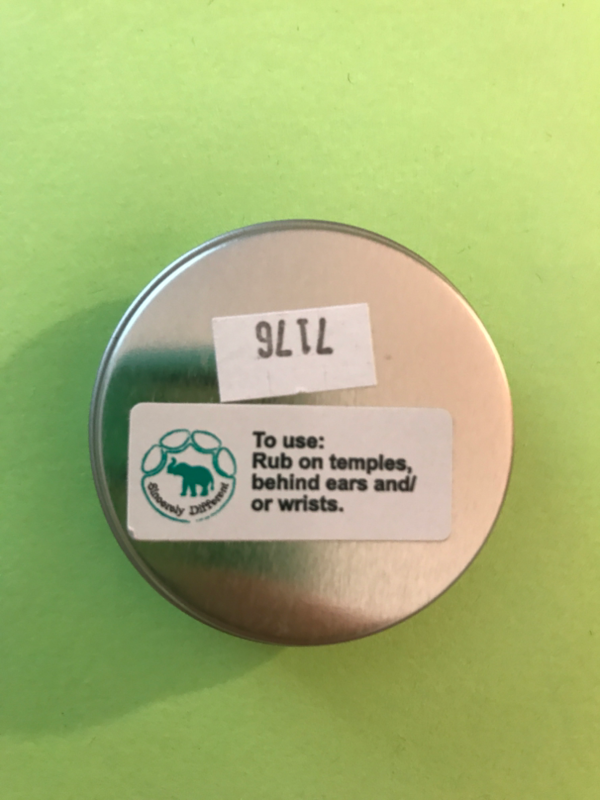 I tried this, and it smells wonderful and is very relaxing, but didn't work on my headache. I think if you have an everyday headache this would work well, though the scent didn't last very long. Retail value $10.00 + $7.50 for shipping. 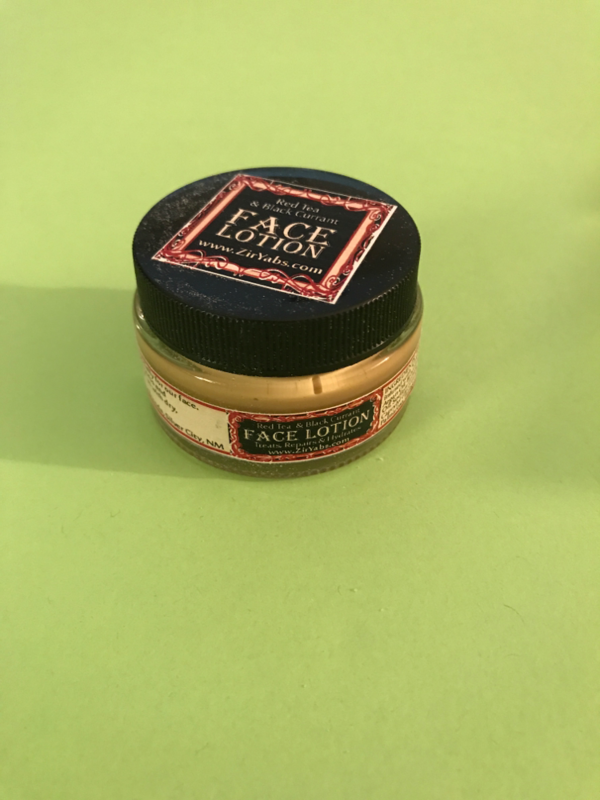 This face lotion is perfect for dry skin, and heals Rosacea + scars. This lotion is very thick and has an extremely wonderful smell to it. 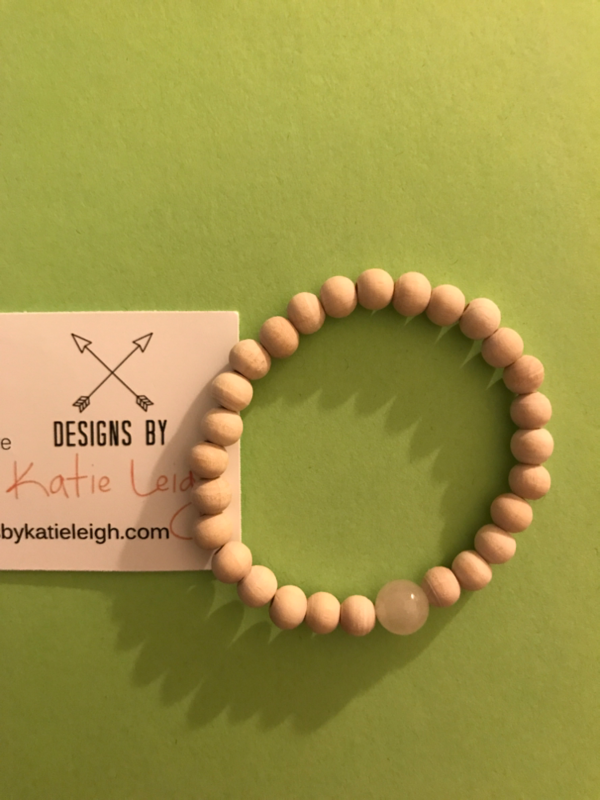 This beautiful raw wood bracelet is perfect for diffusing essential oils on the go. Unfortunately this bracelet was too big for me. I've always wanted one of these. You put the essential oils on the beads. 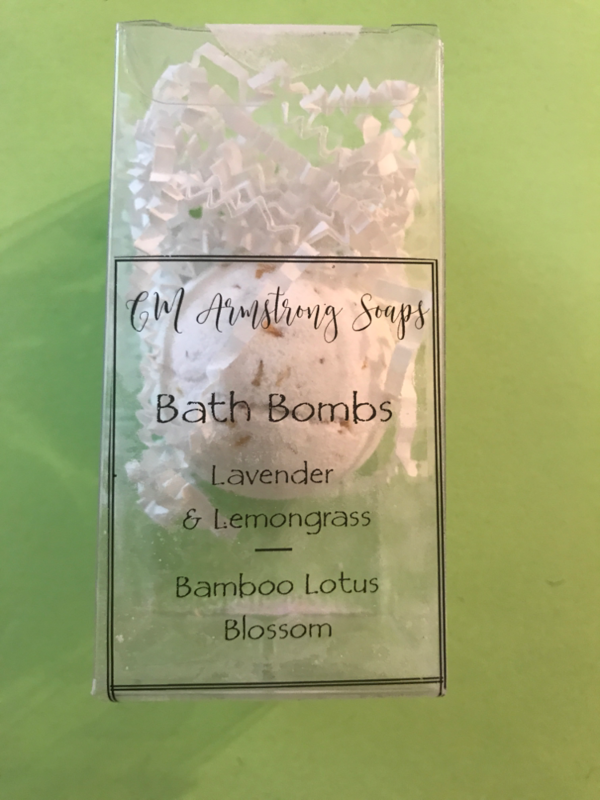 CM Armstrong- Bath Bombs. 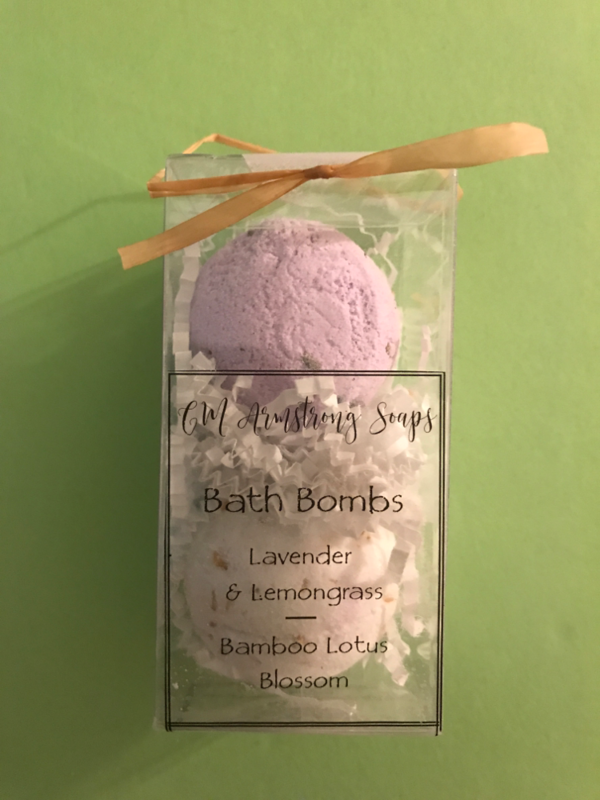 These are made with pure essential oils & essential oil blends. These were the culprits of the grittiness and from the private group it seems a lot of folks bath bombs broke. Mine was opened at the bottom. I did try the lavender & lemongrass. I didn't smell much lavender. It had a musk like scent to it and the scent didn't last long in the bath. Retail value $5.00 + $5.00 shipping. Overall feeling- This box had a retail value of $82.12 not counting the shipping. That's awesome for a box that costs $34.99 (plus shipping). 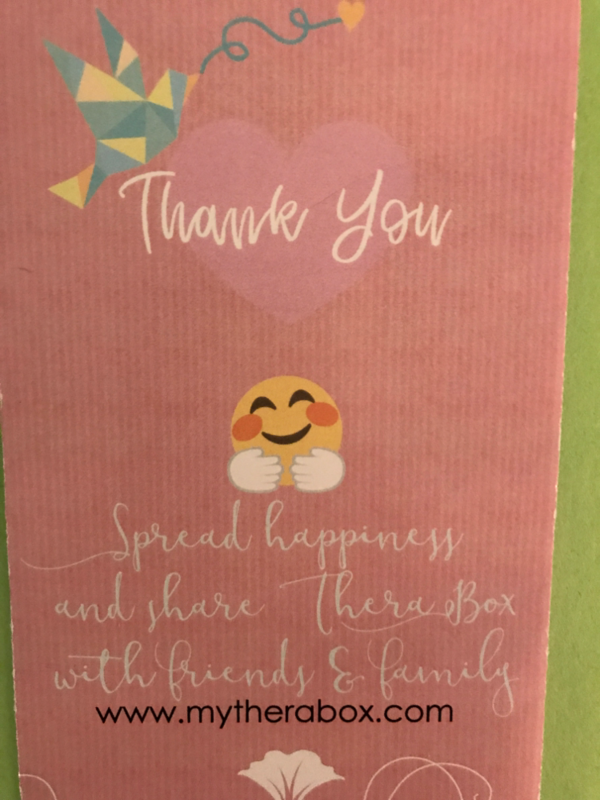 I really love this box a lot. Even though some of the things were missed for me, I'm still really happy with the box overall. I also have to say that their customer service department is great! 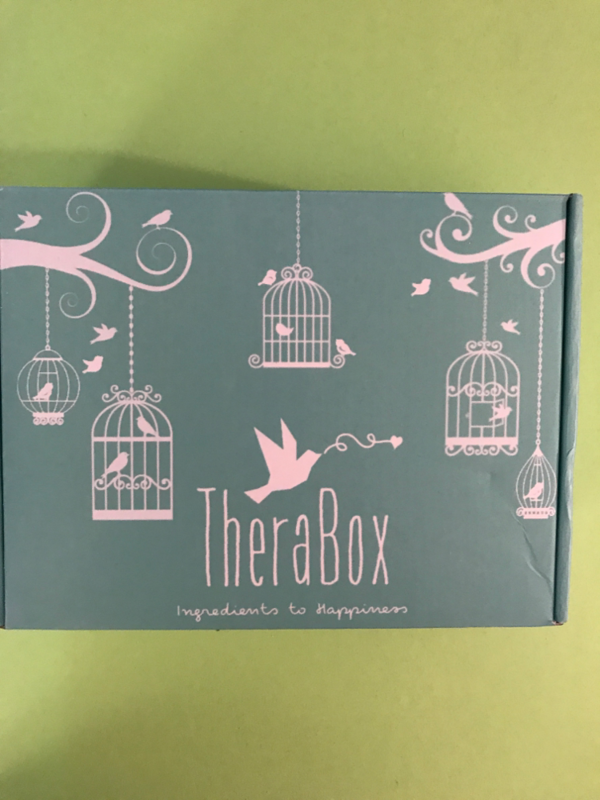 What do you think of Therabox? 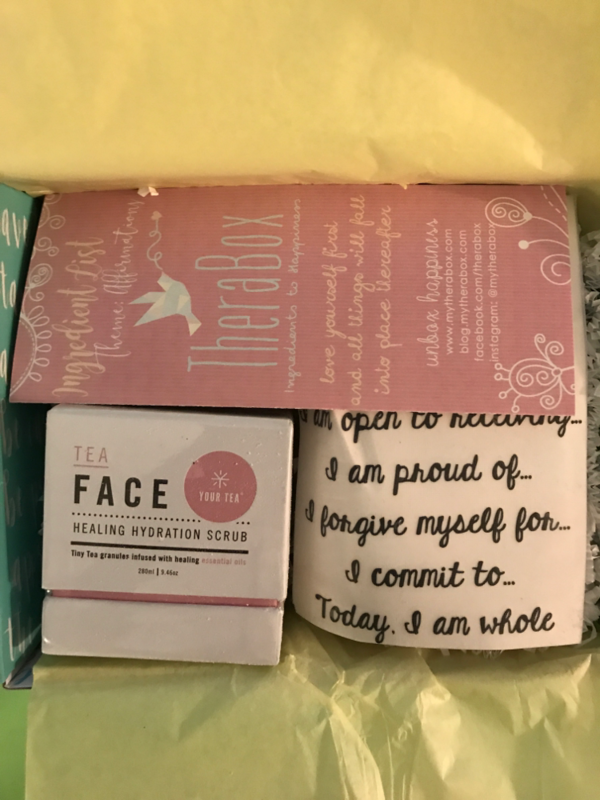 Did you like this month's box?